Recent studies have shown that the creation of the map was preceded by local survey. According to Katalin Plihál, Lazarus used the polar coordinate method. With this method he could determine the place of certain settlements and the rivers’ flow. The advantage of this method is that large areas can be drawn accurately with few tools. The only required device was a compass that could measure azimuths. The drawback was that directions could only be determined by estimates, and because the place of the magnetic poles changed, and certain geological processes also affected the needle, the measures weren’t exact. The “ruins” of the coordinate system used by Lazarus can be found on the south side of the map. Maps depicting Hungary, until János Lipszky’s map in 1808, were stretched in the North-South direction and compressed in the other. This can be attributed to the errors of the tools used and the difficulties of longitudinal measurements. Around these maps, a square can be drawn, whose diagonal is roughly the North-South direction. With this work, as we know from Jakob Ziegler’s letter, Lazarus was finished by 1514. Ziegler was the person who saw the original manuscript, and in 1529, the finished, printed map. He wrote a letter to Georg Tannstetter, which he himself later published. The map drawn by Lazarus was a unique work, and serious challenges had to be downed in order to copy it. According to Katalin Plihál’s research, Georg Tannstetter, who prepared the map for publication, rotated it by 45° counter clockwise. The reason behind this might have been efficiency, to leave the least possible empty space. Because it was intended to be a wall map, as the usual practice in that age, the vertical rectangular shape was chosen. Lazarus’ manuscript was completed with the Latin and German commentaries of the publisher, Cuspinianus. Johannes Cuspinianus: According to the sources, an Austrian diplomat, Cuspinianus found the manuscript, and he brought it to Bécs, and he paid the cost of publication. He offered the printed map to Ferdinand I (1526-1564), Hungarian and Czech king. Cuspisianus died not long after the publication of the Tabula Hungariae, on 17th of April 1529. His monument is in the Dome Saint Stephen in Vienna. Georg Tannstetter: The Bavarian humanist, professor at the University of Vienna, Georg Tannstetter prepared the manuscript for press. In the title of the map, his role is described as “Reviewed and completed by Georgius Tannstetter Collimitius”. He may have written the title and one of the descriptions. Petrius Apianus: The Lazarus map was printed using a new method, stereotype, in the press of the Bavarian Petrius Apianus. He was the first to use this method to print a map. The unknown engraver: We don’t have data about the engraver who created the blocks used to print the map. Only one marking has been found, on the first block, there is a small, gothic style “z” hidden in the landscape. This could be the signature of an unknown master. In catalogues collecting these signatures, nothing has been found so far about this unknown master. 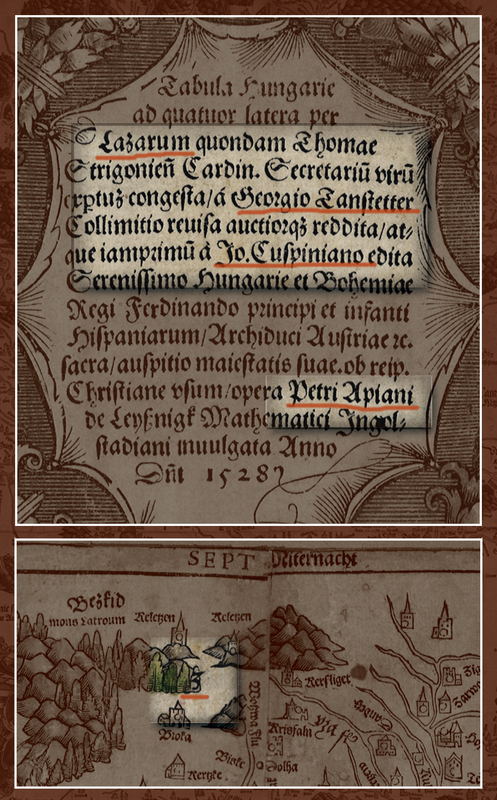 This letter is only visible on the first edition of the map, despite the fact that later publishers used everything, even settlements they could not name. Leaving this “z” only strengthens our idea about it being a signature, and it might be the reason why later publishers left it out. None of the engravers that are known to have worked for Apianus (Hans Sebald Beham, Martin and Michael Ostendorfer) used a signature similar to this. However, on the map of the disciple Paul’s travels, printed in Apianus’ press, which was engraved by Beham, shows similarities to the Tabula Hungariae in certain signs and the border. However, the landscape differs significantly on these maps. It is also possible that the similarities between these two maps come from Beham copying the symbols that the carver of the Tabula Hungariae used. Also, we know that Petrus Apianus’ brother, Georg, was also a carver, but as we know, he never used a signature anything like the one found on the Tabula Hungariae.